Discussion in 'vBench (Works in Progress)' started by MarquisMini, Jul 14, 2008. See photos below of the completed figure. 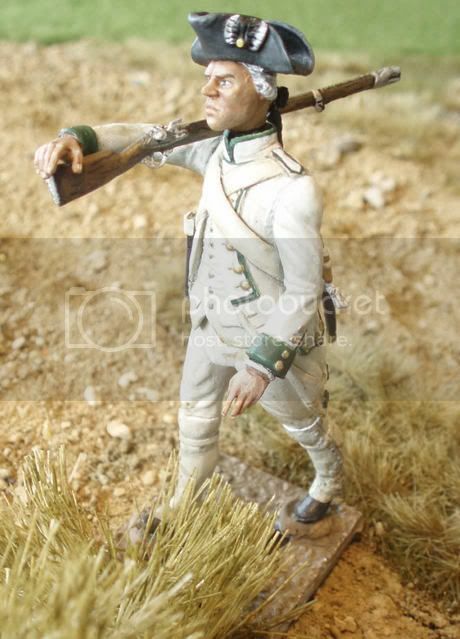 He's now ready to be added to the Yorktown diorama...you'll notice I've placed him marching down to the battlefield. Photography continues to be a struggle as my basic digital camera does not adequately demonstrate highlights and shading, but certainly comments and suggestions for improvement are welcome. Very nice. I especially commend the lovely hands on your piece. I like the groundwork as well. The photos are nice enough for sharing. Greet work. i like him. Personally, I am most impressed by the quality of the paintjob on the face and hands. The eyes on this figure are absolutely alive!! And I have no idea how you can paint fingernails that small. Btw, how did you do the woodgrain on the musket? Victor and Marc - thank you for the kind comments. Been working on perfecting my fleshtones techniques. 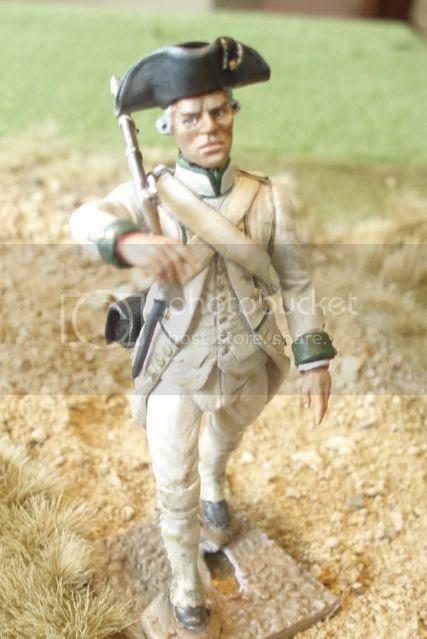 Minerva - I'll post the details of painting the musket separately. Basically, several layers of different browns, accentuated by hand drawn woodgrain (paint pen), followed by several washes both for highlights and weathering effects.